Labyrinths, in various forms, are found in religious traditions around the world. By walking the St. Giles’ labyrinth (a replica of the Chartres labyrinth, laid in the floor of Chartres Cathedral in France around 1220), we are rediscovering a long-forgotten mystical tradition. The labyrinth has only one path so there are no tricks to it and no dead ends. The path winds throughout and becomes a mirror for where we are in our lives. It touches our sorrows and releases our joys. Walk it with an open mind and an open heart. To prepare, you may sit quietly to reflect before walking the labyrinth. Some people come with questions while others just come to slow down and take time out from a busy life. Some come to find strength to take the next step in their life journey. Many come during times of grief and loss. 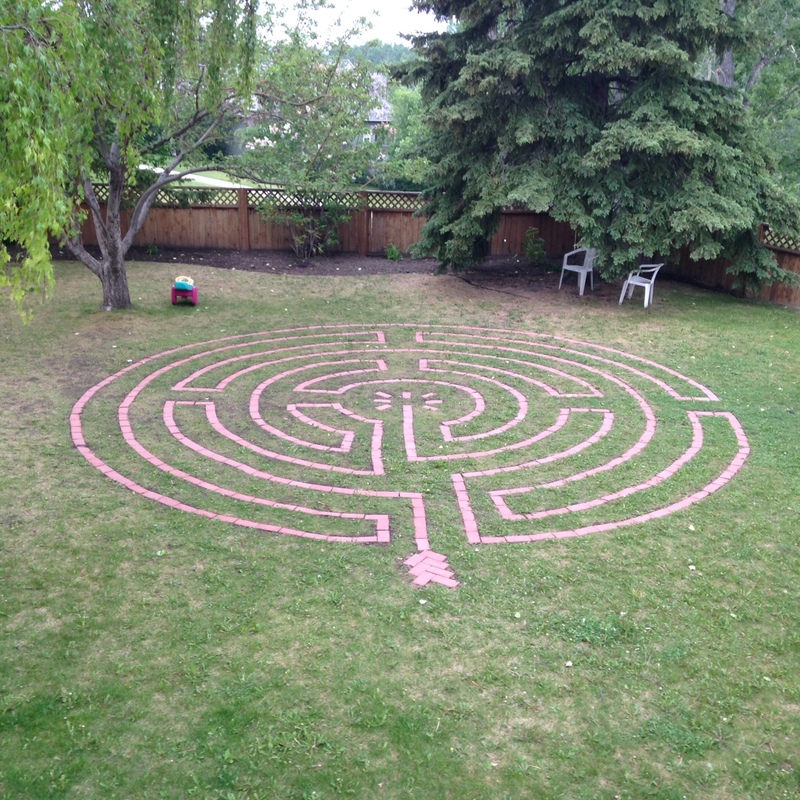 Adults are often serious in the labyrinth. Children most often run in and out as fast as they can, as part of their play. Both are the right way. When you walk a labyrinth, consider choosing your attitude, stating your intention, be it spiritual or reflective, playful or creative. From time to time, choose a different outlook or manner. Play music or sing. Pray out loud. Walk alone or with a crowd. Notice your surroundings. Listen to the surrounding sounds. Most of all, pay attention to your experience. The path is two ways. Those going in will meet those coming out being respectful of others walking. You may “pass” people or let others step around you. Do what feels natural. RELEASING ~ On the way in, let go of the details of your life. This is the act of shedding thoughts and distractions. A time to open the heart and quiet the mind. RECEIVING ~ When you reach the center, stay there as long as you like. It is a place of meditation and prayer. Receive what is there for you to receive. RETURNING ~ As you leave, following the same path out as you came in, you enter the third stage, which is joining God, your Higher Power. Symbolically, and sometimes actually, you are taking back out into the world that which you have received. Each time you walk the labyrinth you become more empowered by the Spirit to find and do the work for which you feel your soul is reaching. FOCUS: Pause and wait at the entrance. Become quiet and centered, maybe take several deep breaths, say a short prayer or close your eyes. Give acknowledgement through a bow, nod or other gesture and then enter when you are ready. EXPERIENCE: Walk purposefully, at your own pace (fast or slow) following on the line of bricks. Consider walking bare foot to feel the path below you and connect to its grounding forces. Observe the process. Concentrate on the placement of one foot before the other and rhythmic, gentle and regular breathing. Let go of any expectations. When you reach the center, stay there and focus, sit or lay down if that is what you feel. Leave when it seems appropriate. Be attentive on the way out. EXIT: Turn and face the entrance. Give an acknowledgement of ending, such as “Amen”. REFLECT: After walking the labyrinth, reflect back on your experience. Adopt a sense of gratitude and offer thanks. You might sit on one of the benches in quiet reflection, or use journaling or drawing to capture your experience. WALK OFTEN: You are welcome here. Each journey will be unique. There are many ways to describe a labyrinth. It is a path of prayer, a walking meditation, a crucible of change, a watering hole for the spirit and a mirror of the soul.